QR Codes are those weird-looking blocks of white and black that looks like an unfinished crossword puzzle or terrazzo floor. In fact, those squares contain a lot of data that can be read with a simple app on any smartphone. Typically, the information is a web site link but can include name and address information, a sales message or instructions. An example, linking to our home page www.qwikprint.ca is shown at right. To read a QR Code you need a mobile with a built-in camera and the necessary QR code reader software installed. 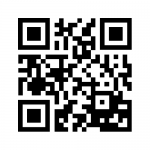 To read the QR code, hold your phone over the code and click on the reader app. This will launch the web browser on your phone and immediately direct you to a webpage assigned to the QR code. This linking from a physical real-world object is known as a “hard link”. How can QR Code technology help your business? If you are a tourism business, add it to your print materials and ads. Visitors need to find you and don’t have a computer handy. Instead of searching, they can simply hold their phone over your ad and be immediately directed to a map or other page on your site. If you are a retailer, you may want to include a QR code in your newspaper ad for direct mail marketing piece which would drive readers back to your website where they could get additional information on the products on sale and special offers only available through your website. There are lots more ways to do it and we can easily add a QR-code to any printed items, including a business card. Tell us what you it to contain and we’ll create it for you.